It’s not often a quarterback fills 19 straight passes to open a game and still lose. 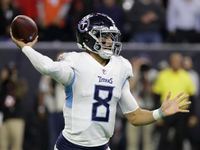 But it was just the kind of unusual night that Marcus Mariota had lost on Houston Texans on Monday’s 34-17. Mariota finished 22 out of 23 passes for 303 meters and two touchdowns. He also completed 19 straight passes before breaking an incomplete Titan final possession by just over a minute to go. 9 straight supplements only three left 10 meters in the air. Still, Marietta’s performance was stable and encouraging given that he was dealing with a headstroke at the beginning of the week that initially threatened his participation in the game. While the finishing touch was impressive, Titans (5-6) has to win several wins to have a shot on a playoff dock.